Post Tagged with: " Soccer "
Currently in London, an army is under fire. The Yid Army, the proud fan base of one of England’s top-tier soccer teams, Tottenham Hotspurs, has come under scrutiny from not only the English Football Association and opposing fans over its nickname and cheers, but also from local police. This problem is not just affecting the United Kingdom. 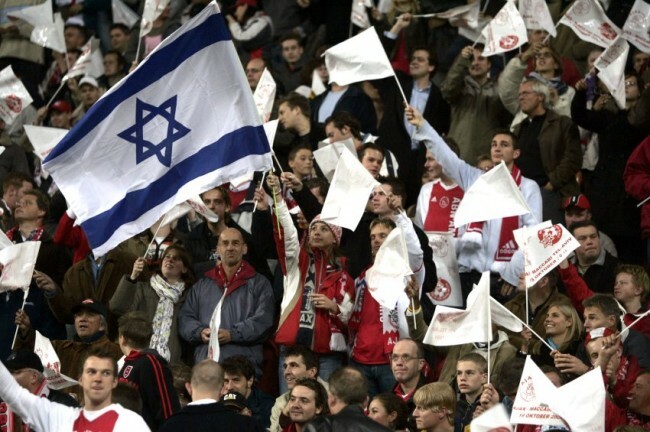 The legendary Dutch team, Ajax, has encountered similar issues with its fan group, The Super Jews. Fans of both clubs historically incorporate Stars of David into their banners and posters, and many supporters adorn them selves in Israeli flags with their club’s logo on it. Others have something written in Hebrew on their shirts and jerseys. During matches fans from both clubs also infamously use songs in Hebrew, such as “Hava Nagila,” as fight songs. “Many times in the stands of White Hart Lane, you see people with Israeli flags and Stars of David. It is fantastic,” said Rolfe Jones, president and co-founder of the L.A. Spurs, the local branch of the Tottenham fan club. From the beginning, both Tottenham and Ajax gained reputations as “Jewish clubs” due to their locations in predominantly Jewish regions. Amsterdam was referred to as “Jerusalem West” during World War II, and De Meer stadium, Ajax’s original home arena, was located in eastern Amsterdam, where most of the city’s Jews lived. In the case of Tottenham, many Jewish immigrants to London in the 19th and early 20th centuries settled in the East End of London, where Tottenham played their early home games. Today, many Jews still prominently support both teams. Over the last two years, officers have begun arresting fans at Tottenham games for “Yid” chants or for signs, as well as opposing fans with hatful chants and hissing noises — a reference to the sound of gas at death camps — and were charged with knowingly committing a hate crime. “English soccer for a long time would feel anything said in a stadium was fair game, and unlike how they would act in real life, while in the last few years people have become held to a higher standard,” Yahoo! Sports soccer writer Martin Rogers told the Journal. The Community Service Trust (CST) in the United Kingdom, an organization dedicated to preserving and protecting the British Jewish community, released a statement on its website condemning the behavior. When contacted for comment, the local branch of the Anti-Defamation League said its views mirror those of the CST. Despite then-manager Andre Villas Boas claiming that the club would cooperate with the league, the term remains very much in use to this day. Los Angeles resident and Ajax fan Peter Erickson spoke about how he felt the issue with anti-Semitism isn’t the Super Jews, but the opposing fans — who also have been gaining the attention of authorities. “The Ajax fans act out of a respect for the culture and a love for the club,” he said.